I was noticing the DOW fell 700 points today after the Bailout Plan didn’t pass. Then I was thinking about the collapse of Washington Mutual last week and it reminded me of a conversation from one of my favorite movies, “Sneakers”. Sept. 25 (Bloomberg) — JPMorgan Chase & Co., the third- biggest U.S. bank by assets, agreed to acquire Washington Mutual Inc.‘s deposits and branches for $1.9 billion after regulators seized the thrift in the biggest bank failure in U.S. history. Customers withdrew $16.7 billion from WaMu accounts since Sept. 16, leaving the Seattle-based bank “unsound,” the Office of Thrift Supervision said today. WaMu’s branches will open tomorrow and customers will have full access to all their accounts, Sheila Bair, chairman of the Federal Deposit Insurance Corp., said on a conference call. I never took any art classes and I don’t know how to draw, paint, sculpt, etc… but I have been spending a large amount of time over the past several months getting more and more into my obsession with design. Trying to take apart what I consider “good design” into the process components that might have been involved in bringing those wonderful ideas, or reimaginations, to reality. During my reading I came across some keywords that have opened my design education. Keywords are the keys to the kingdom when it comes to internet research. You find the right set and they will guide you to all the others. This time it was “Design Thinking”. 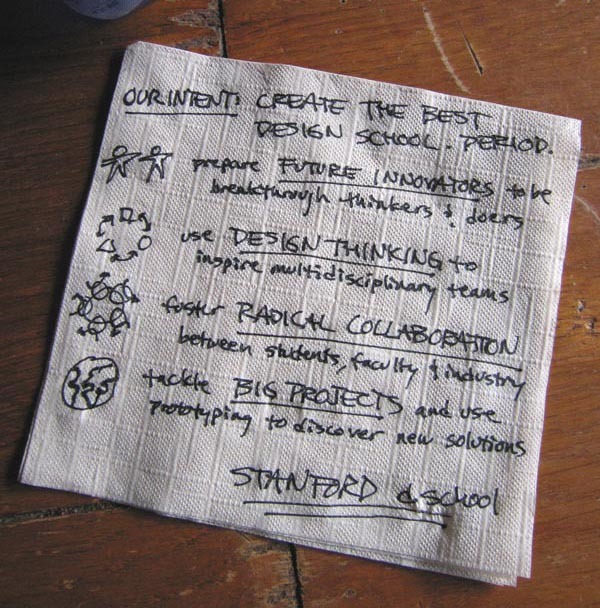 I came across the term when reading about Stanford’s d.School and how they were applying the Design Thinking process in a collaborative effort with their business school. One link led to another and I was hooked. This is creative, analytical, visual problem solving. Design thinking is a process for practical, creative resolution of problems or issues that looks for an improved future result. Unlike analytical thinking, design thinking is a creative process based around the “building up” of ideas. There are no judgments in design thinking. This eliminates the fear of failure and encourages maximum input and participation. Outside the box thinking is encouraged in this process since this can often lead to creative solutions. Everywhere I’ve looked I have found applications for this type of problem solving. I like “what if” scenarios (to a point) and I like applying them in open problem solving arenas. I always try to see hurdles as opportunities. More often to run around than jump over. I’d like to say I’ve been using this type of problem solving for a long time but there is a lot I can learn here. Maybe you can too, in your business, in your personal/social life, wherever. Tim Brown of IDEO (one of the most successful design firms in the world) is largely credited with coining the term and is it’s lead evangelist. Check out his blog at http://designthinking.ideo.com for some thoughtful musings on the process. Also check out http://www.core77.com for some really hot designs. So, we had a bit of a media black out this summer. It started around the end of May when I descended into my basement and stuck my face in a bunch of books. I was studying for the CISSP certification for about two months. My nights and weekends were dedicated to the obscurity that is the depth and breadth of that study material. Well, after burning June and July on test prep I flew down to Los Angeles and sat for the exam. It is considered the standard for computer security professionals and is taken on scantron paper with a #2 pencil. (This may give you some idea how much they trust computers.) 3 hours and 46 minutes into the the allotted 6 hours I walked out. I wasn’t entirely sure what the result would be. Two weeks after that I found out I passed. Whew… finally. I’ve been looking at that test for a long time. A FULL SIZED HOME ARCADE!!!! It isn’t finished. 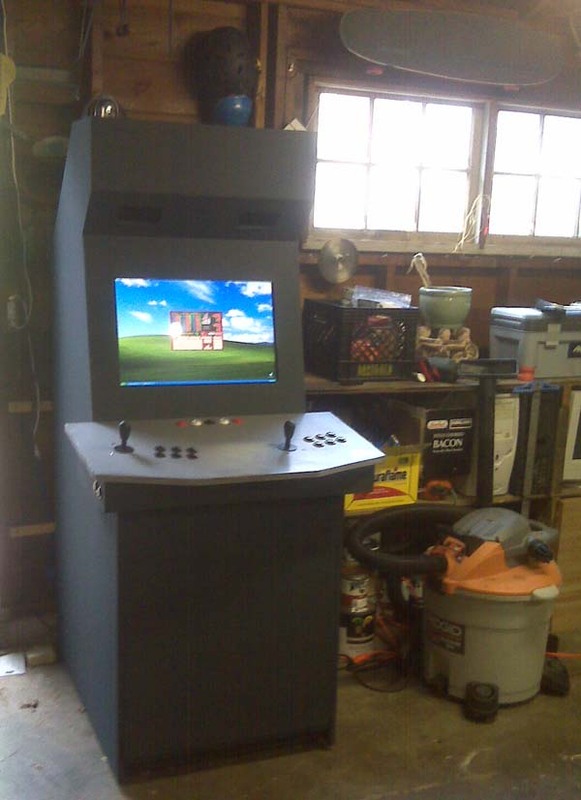 We still need to add the trackball, cup holders, and the *very important* kegerator with taps for Player 1 and Player 2. It isn’t as pretty as some models you can buy for lots of $$$ but whatever, I learned a lot in the process. I’ve got some other projects in development so stay tuned for updates.